I graduated from The Ohio State University in 2010 with a Bachelor’s Degree in Dental Hygiene and a specialization in Marketing. 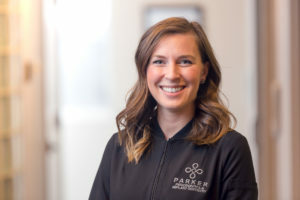 After working for seven years as a clinical dental hygienist, I joined Dr. Parker and his amazing team as their Professional Relations and Marketing Coordinator. While I love all aspects of dentistry, I also thoroughly enjoy working with referring offices to ensure that communication about the care and treatment we provide our patients runs as seamless as possible. It is a joy to share in Dr. Parker’s passion for excellent care and sharing his vision for dentistry with the world!